Samsung launches world's first Ultra HD Blu-ray player | What Hi-Fi? 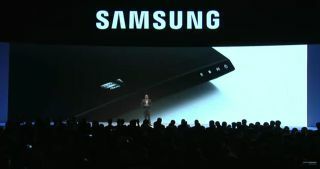 Samsung has introduced the world's first Ultra HD Blu-ray player at IFA, promising to support Ultra HD Blu-ray discs and 4K streaming services. The Samsung press conference is still ongoing at IFA 2015 but the news of the company's first Ultra HD Blu-ray has been slipped out as a footnote in a press release. Promising to play Ultra HD Blu-ray discs and support 4K streaming services, the player claims to match the design of Samsung's curved SUHD TVs. It will also support HDR (high dynamic range) content. Amazon Video, Netflix and YouTube all offer 4K content, and it was largely expected we'd see the first UHD disc players at IFA. Samsung has now confirmed it will be released "early next year" across Europe. It was also confirmed by the Ultra HD Alliance that the first Ultra HD Blu-ray disc will be Kingsman:The Secret Service. Fox Home Entertainment has also announced that it will make all upcoming releases available in 4K Ultra HD on the same day that Blu-ray discs go on sale. In addition to Kingsman, other titles being readied for 4K release are Exodus: Gods and Kings, Fantastic Four, X-Men: Days of Future Past, Life of Pi, Wild and The Maze Runner. There was no news from Panasonic, who had hoped to be the first company to release an Ultra HD Blu-ray player. There was no official word on pricing but we were told back in May that we could expect UHD players to cost "two to three times" the price of existing, comparable Blu-ray players. We will update this story with more details and pictures, as we get them.